One of the most impressive Christmas displays in western North Carolina, Christmas at Biltmore is nothing short of spectacular. Their theme for 2015 is “A Gilded Age Christmas” and Biltmore is definitely living up to that theme! George Washington Vanderbilt, grandson of Cornelius Vanderbilt, was Biltmore Estate’s first owner. His grand, 250-room, 175,000 square-foot home took six years to complete, and was opened to friends and family on Christmas Eve of 1895. Christmas and Biltmore go hand and hand, and wow, the folks at Biltmore know a thing or two about putting together some serious holiday splendor. 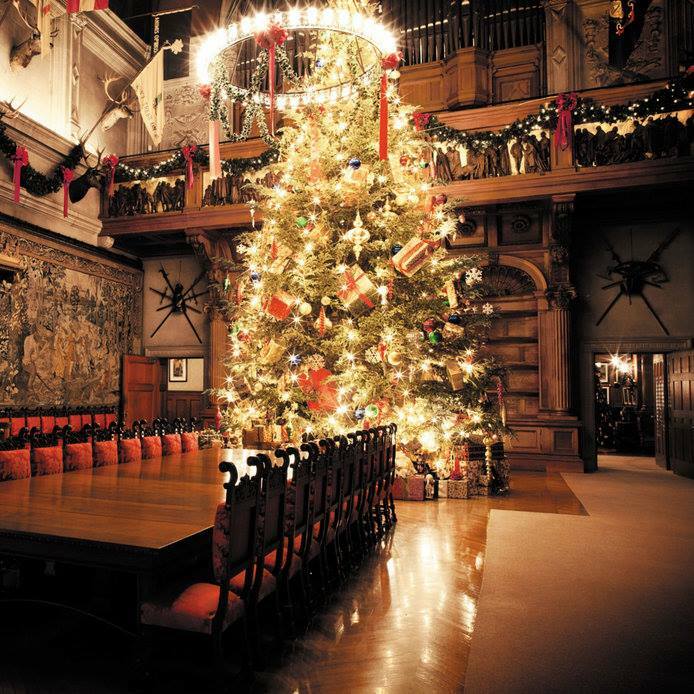 Throughout the four floors of Biltmore Estate open to the public, you will find decorated trees in most of the rooms, garland, twinkling lights, and live Christmas music. Beyond the house, the Conservatory is outfitted with the addition of holiday plants and creative decorations. The tradition of welcoming visitors to Biltmore has been kept alive by Mr. Vanderbilt’s descendants, who own and run the estate today. 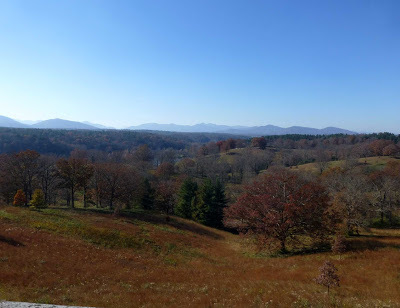 When you go, you’ll of course want to tour the beautiful Biltmore House, set on 8,000 acres of forested land, with amazing views of the mountains and plenty of walking paths through gardens and park-like outdoor spaces. A dairy on the estate was converted to a winery in the mid-1970s, and the area around it built up beginning in 2010, into what is now called Antler Hill Village & Winery. In addition, you can find restaurants on the estate and even two hotels. 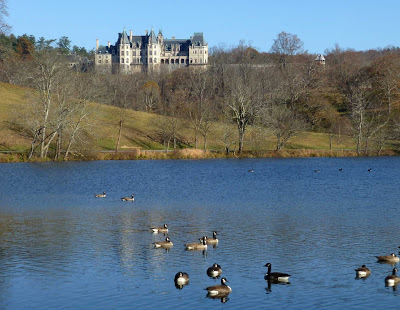 A small route around a lagoon between Biltmore House and Antler Hill Village & Winery offers a unique view of Biltmore House from the back. CANDLELIGHT CHRISTMAS EVENINGS AT BILTMORE: Christmas at Biltmore has begun, and with it, the opportunity to take a self-guided tour of Biltmore House in a more intimate evening setting. Crackling fireplaces and candlelight set the mood, with live music throughout the house as well. Guests of the Inn on Mill Creek B&B can upgrade their daytime admission Biltmore tickets purchased at the Inn to add a Candlelight Christmas Evening tour, at just $15 per person. We will help with making all of the arrangements for your tour time and confirmation. 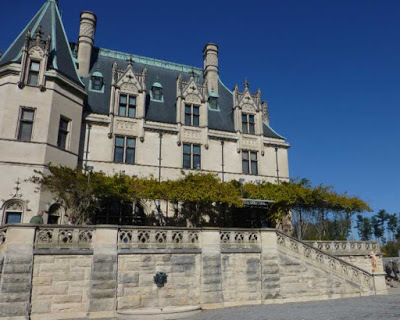 DECEMBER 2015 BILTMORE TICKET SPECIAL FROM THE INN ON MILL CREEK B&B – BUY ONE GET ONE FREE DAYTIME ADMISSION TICKETS: All guests who stay with us in December will receive a FREE Biltmore daytime admission ticket with the purchase of one Biltmore daytime admission ticket. 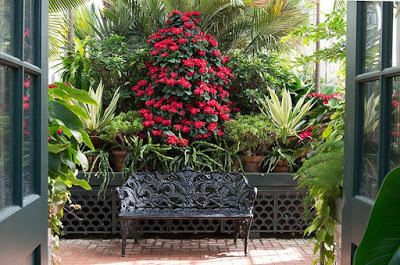 In December, our Biltmore tickets are available at a discounted rate of $50 per person, keeping even more green in your pocket! Tickets are good for a daytime visit to Biltmore Estate on any day of the week, and are also good for the following day for FREE. And don’t forget, you can upgrade your daytime admission tickets purchased at the Inn on Mill Creek to add a Candlelight Christmas Evenings self-guided tour of Biltmore House for $15 per person. Visit our website at www.innonmillcreek.com to check room availability. This entry was posted in Asheville Festivals and Events, Biltmore and tagged Asheville, Biltmore, Winter by Inn on Mill Creek. Bookmark the permalink.